PHOTO SUBMITTED Pictured above is a game of Knockerball. Those interested have a chance to play it during the grand opening event of SenCo Knockerball Saturday on the Tiffin University campus. A new sport recreational company is making its first appearance Saturday during a grand opening event. SenCo Knockerball’s grand opening is set for noon-4 p.m. in the Heminger Center, 350 Miami St., on the campus of Tiffin University. Co-owners Amy Lutz and Chelsea Keller came together to give Tiffin another activity for the youths and adults. SenCo also is to be available for fundraisers. Keller said a group just needs to provide the space; they will provide the equipment. 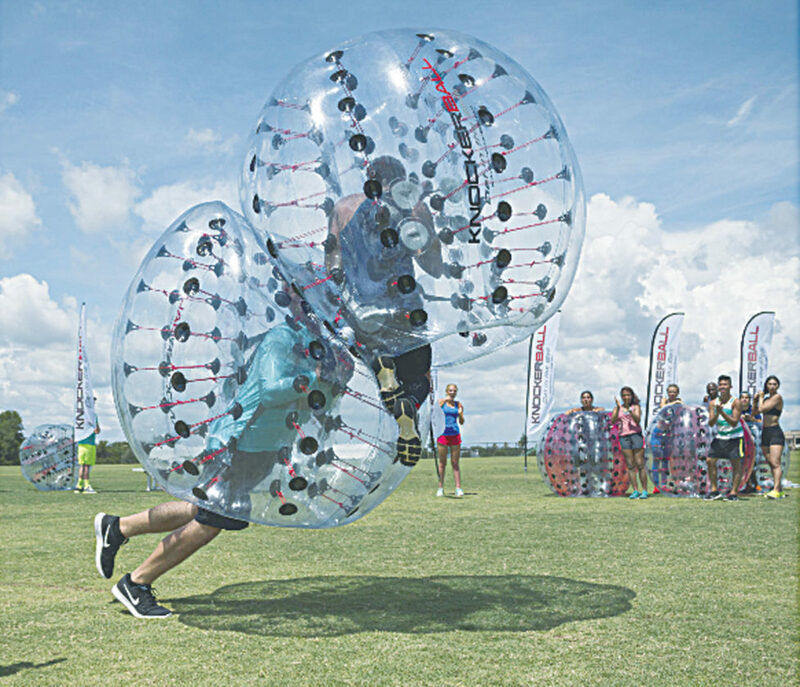 Knockerball essentially is a bubble that fits over a player’s head and down to the knees and lets participants run and play contact games without the pain of impact. Lutz said they wanted to provide the people of Tiffin another outlet for recreation and there isn’t anything like this around. “It all comes back to just having fun,” she said. Lutz and Keller said they hope to branch out to provide more than Knockerball. The grand opening event is to offer 5-on-5 games for elementary school-aged children through adults. The event allows participants to play games in the Knockerball for five minutes for $5. There also is to be a double elimination Knockerball Soccer tournament for high school-aged students. Winners are to receive discounts on rental packages. There still is space available to teams to register. They require a 10-team minimum. gmail.com. The business also is on Facebook.